Through a specific architectural lens, this book exposes the role the British Empire played in the development of apartheid. Through reference to previously unexamined archival material, the book uncovers a myriad of mechanisms through which Empire laid the foundations onto which the edifice of apartheid was built. It unearths the significant role British architects and British architectural ideas played in facilitating white dominance and racial segregation in pre-apartheid Cape Town. To achieve this, the book follows the progenitor of the Garden City Movement, Ebenezer Howard, in its tripartite structure of Country/Town/Suburb, acknowledging the Garden City Movement’s dominance at the Cape at the time. This tripartite structure also provides a significant match to postcolonial schemas of Self/Other/Same which underpin the three parts to the book. Much is owed to Edward Said’s discourse-analytical approach in Orientalism – and the work of Homi Bhabha – in the definition and interpretation of archival material. This material ranges across written and visual representations in journals and newspapers, through exhibitions and events, to legislative acts, as well as the physicality of the various architectural objects studied. 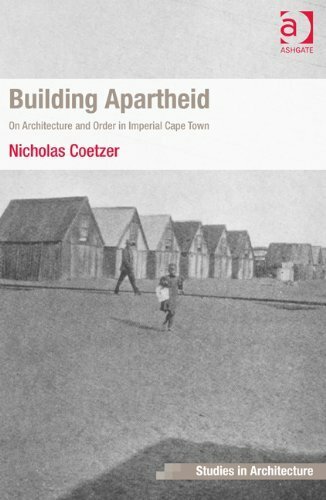 The book concludes by drawing attention to the ideological potency of architecture which tends to be veiled more so through its ubiquitous presence and in doing so, it presents not only a a story peculiar to Imperial Cape Town, but one inherent to architecture more broadly. The concluding chapter also provides a timely mirror for the machinations currently at play in establishing a ‘post-apartheid’ architecture and urbanity in the ‘new’ South Africa. Text: Coetzee Nicholas. pp. 230; hardcover. Publisher: Ashgate, London, 2013.